Airfoil for Windows can stream audio from just about any application running on your Windows machine. With a number of popular audio applications, an enhanced experience offering metadata and remote control is provided. We hope to add more supported sources, but we need help from developers to make their audio applications scriptable. See Supporting Additional Apps for more details! When you stream audio from supported sources through Airfoil Satellite (or the older Airfoil Speakers), an Apple TV, or many third-party AirPlay devices, you'll see enhanced metadata, including track titles and album artwork. These outputs will also be able to remotely control audio playback in the source application. In the screenshot above, for instance, Airfoil Satellite for Windows is receiving audio from iTunes, via Airfoil. Album art and track titles are being shown, and remote control buttons are available to control playback. 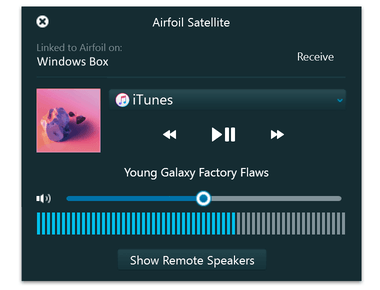 An enhanced experience with many more applications is possible with Airfoil for Mac. For details on supported Mac applications, see the Supported Apps for an Enhanced Experience With Airfoil for Mac page. If you've got a favorite audio application you'd like to see work with Airfoil Satellite, let us know! If you're a developer who makes an audio application, you can integrate with Airfoil and Airfoil Satellite as well. Start with this blog post, and send us an email. If you need personal assistance, or you just want to provide feedback, you can reach our support team via email. We're amazingly responsive! We strive to reply in under 24 hours.